Desks are important pieces of furniture that adorn our homes, offices, schools and colleges. Aside from being used for writing, it is also used for storing files, papers, stationery and other personal belongings. In general, desks can be of different types: simple desks, computer desks and executive desks. Regardless of the type of desk, most of these desks are known to have common structures and body parts. Drawers in a desk are used for storing items, which include stationery, paper, important documents and files and media such as DVDs. Most of the drawers in an office desk are generally made from the half-inch thick plywood. The drawers are generally fitted with aluminum rails that provide support for the draw. The draw has wheel like parts fastened to its sides that slide into the aluminum rails, allow the draw to slide in and out. These rails are made from the 1/8 by 3/4 inch aluminum flat stock that is easily available in any hardware shop. It is less common, but a desk can have grooves in its sides that the drawers simply slide into, no metal involved. Drawers usually have a security locking system as well. A shelf is one of the most common parts of any desk. The desk shelves are mainly used for keeping books, magazines, files, manuals, document, DVDs and other items. 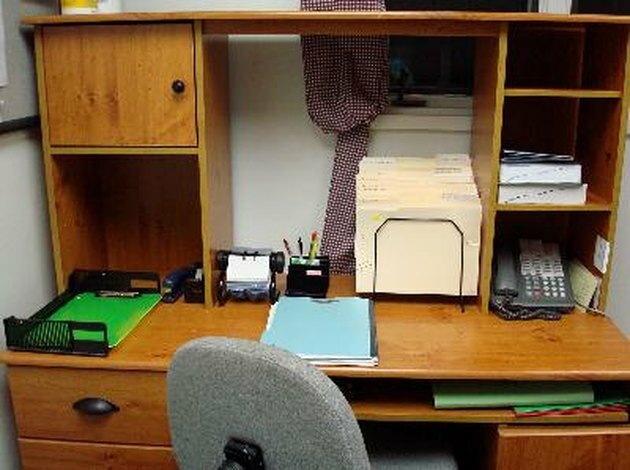 Some desks have a single shelf, whereas certain desks comprise multiple shelves. The number of shelves on a particular desk model would depend on your need and requirements. Almost every desk has a flat-top surface. The sole purpose of having this flat surface in the desk is to provide a smooth space for writing. However, the area of this surface depends on the type of utility and requirement of the user. For instance, the desks that are used in schools, colleges and offices have a broad flat top surface to provide the user with a larger surface area for writing, whereas, unlike the executive desks, the area of the flat top surface in computer desks is quite narrower. Another important part of a desk is the cabinet. A cabinet is an enclosure, generally fitted with doors, for storing items. Most cabinets come with a locking system as well. Executive desks usually come with cabinets whereas those that are used in schools and colleges do not include a cabinet. You can always customize your desk to suit your needs.